While many people stick to the blackjack table, baccarat is a casino card game that should definitely not be overlooked. It’s a classic game that offers great odds and it’s simple to play. Actually it’s probably a lot simpler than blackjack or even craps. Besides being simple, Baccarat offers a number of betting options that keep it interesting throughout. The amazing thing about playing online baccarat is that it’s really fast. At a land-based casino, the game can sometimes drag on since there’s a lot of shuffling of the cards, and other elements that slow down the gameplay. In online baccarat you can really play a lot of hands in a short amount of time, making the game that much more thrilling. Another significant bonus that comes with playing baccarat is that the house edge is really low at only 1.06% for bet placed with the “banker”, which we’ll explain further on. So, if you’re not familiar with this game yet, we hope this article will shed some light on the topic and maybe even get you interested enough to try it out. Baccarat is really easy to play. Actually it’s a lot like the even-money bets on a roulette table, just with cards. There’s no real strategy to worry about here since the bets are essentially even-money (except for the tie at 8 to 1). That being said, this is still a high-value game with low house edges which is pretty amazing considering you don’t need to spend much time learning how to play it. First, place your bet. Decide if you wish to bet with the players, with the banker, or on a tie. Now the cards are dealt. The players and banker are each dealt hands consisting of 2 cards. Finally, the winner is determined. Aces are worth 1, the cards from 2 to 9 are worth their numerical value while 10s and face-cards are all worth 0. The value of a hand is the right-hand digit of the card’s total value. So, if you’re dealt a 7 and an 8 card, the value of your hand is 5: 7 + 8 = 15; the right-hand digit is a 5. In Baccarat the target value is 9 so you’ll want to get to close as 9 as possible. Unlike in blackjack, in baccarat you can’t “bust”. Sometimes a third card will be dealt. The decision to draw a third card is based upon a set of rules that never change. For example, one rule is that if the player’s total is less than or equal to 5, that player’s hand draws a third card. You don’t need to know the rules for when a third card needs to be drawn since it’s an automatic part of the way the game is played. The great thing about playing baccarat online is that it’s fast. In a land-based casino there’s a lot of shuffling involved as well as other factors that can really slow down the game. In online versions, the hands are quick making the game more dynamic. By betting with the player, your bets will return even-money wins. By betting with the banker, you’ll also get even-money wins, but minus a casino fee. By betting on a tie, you’ll win either 8 or 9 times your bet. This amount varies from casino to casino but will usually be printed on the “table” somewhere, usually under the game title. As you can see, correctly betting on a tie result can yield really big wins, but remember that’s because the odds are quite high for that outcome. The reason that betting with the banker will deduct a casino fee is that it has been determined that over a playing session of 8 decks, on average the banker will win 3 to 4 more hands than the player. This is due to the rules for determining if a third card should be dealt or not. When betting on the banker, you’ll reduce the house edge to a mere 1.06%. This is one of the safest bets in any casino. Betting on the player has a house edge of 1.24%. Also, never get caught up chasing any patterns that you may have observed. Every hand dealt has the exact same odds as the one that came before it. Online casinos that offer baccarat will almost always offer a free version of the game. All bets made in the free version are purely symbolical, but so are any wins you make. This is a great option for newcomers to the game and when you want to experience the real thrill of winning at the baccarat table, all you have to do is click on the “Play for real money” button. This button will take you through a short registration process. You will then be able to go to the cashier and use your preferred payment method to make a deposit. You can deposit as much or as little as you please although most casinos will obviously have a minimum deposit amount. 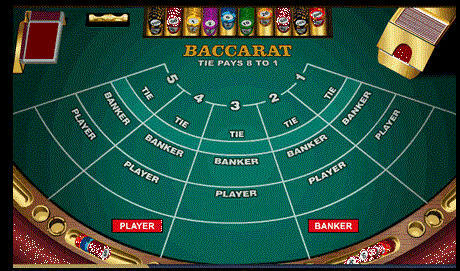 If you do decide to play baccarat for real money, be sure to play at a reputable casino. All the online casinos recommended on our site have been thoroughly checked to be fair businesses and are all monitored by third-party organizations. 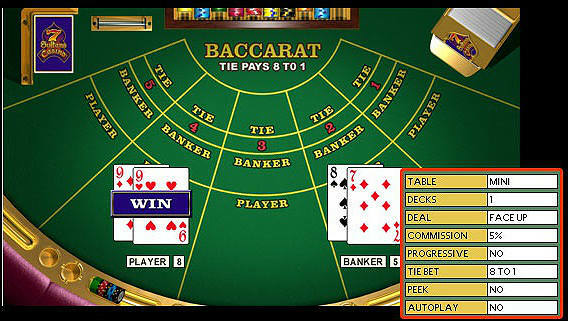 Baccarat is a classic casino card game that captures the thrill and style of the casino experience. We really recommend playing a couple of hands of baccarat. It’s a really fun game to play and also offers some of the best odds of any game in the casino. Bets played via the banker offer a house edge of only 1.06% which is rare for a casino game.